Park Jung Min has expressed his gratitude to his loyal fans. He later tweeted, “As a bonus, one more picture~ From my family vacation~ Peeling the clothes off an egg~!”, “Uh oh, I made a mistake… I meant to say I will ‘work’ hard but I made a typo~ here’s a bonus,” and added another picture. 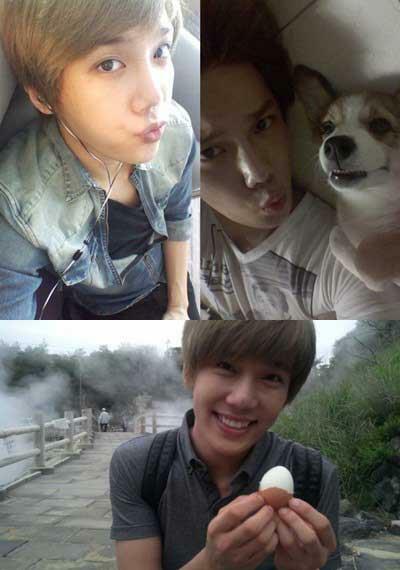 The first picture revealed Park Jung Min laying in bed and making a face with his pet dog Jeom Rye. Another picture showed the smiling singer peeling a hard-boiled egg at a hot spring and finally a close-up self picture. This entry was posted in News, Photo, Translation, Twitter and tagged Park Jung Min, Photos, Twitter. Bookmark the permalink.